Was buying another DJI drone at Maplin with the current cheap price + code and found these..
added code to get the lower price. of all the hyped prices that are then reduced!! Presumably another overseas based company where you get stung for import duties or at the very least a non-UK warranty? so more than happy, if the extra cashback comes will just be an added bonus! Hope so matt, was only 2 clicks away from maplin purchase, been waiting …Hope so matt, was only 2 clicks away from maplin purchase, been waiting and waitingso more than happy, if the extra cashback comes will just be an added bonus! I bought one off Banggood recently. 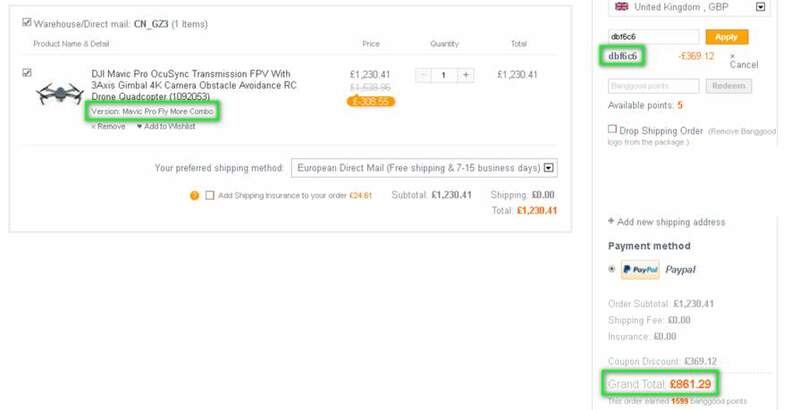 Mavic only for £640 + £38 cashback tracked. Delivered within 7 days by DHL. Paid £3 customs, was marked as worth £21 or something. No European warranty tho but can get DJI Care Refresh. I bought one off Banggood recently. 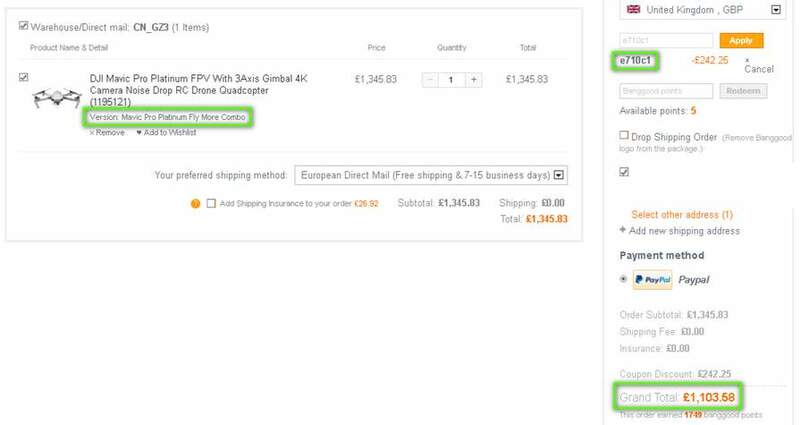 Mavic only for £640 + £38 cashback t …I bought one off Banggood recently. 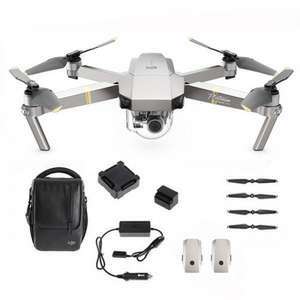 Mavic only for £640 + £38 cashback tracked.Delivered within 7 days by DHL. Paid £3 customs, was marked as worth £21 or something.Would recommend.No European warranty tho but can get DJI Care Refresh. Those that had it tracked on TCB, how long did it take to show as tracked after order? Amazing price HOWEVER they're all made in china yet you cant claim an UK/EU warranty if you buy it from china and risk waiting months for a replacement? Hmmmm I'll let this deal pan out a little and see how the general consensus is. With the mavic, you only have one option for delivery. Says 7-15 days and you have to pay $3. Quite happy with the service tbh. Ordered from tomtop before and preferred how their packaging. They had it in a cardboard box with foam keep the mavic box secure. Banggood had it in a massive bubble wrap type of bag which wad in a plastic bag. Box had some small dents, nothing major. Think they have realised that the customs charges are putting people off of these big ticket items. Thanks OP!Those that had it tracked on TCB, how long did it take to show …Thanks OP!Those that had it tracked on TCB, how long did it take to show as tracked after order? If you do go for it, recommend a friend or partner to TCB and use their account. That way you'll get an extra tenner, five on your account, five on theirs. Inching ever so closer to getting it from TomTop. Could you expand on DJI care refresh - so it doesn't matter if I buy the drone from China, I can purchase the care refresh in the UK and it will cover my product in Europe? From when I researched it, I think you get to have two replacements a year. You pay the initial £99 and then £79 for first replacement and £150 for the second. Each time you have to send the drone back. So if you lose your drone due to a fault you won't be able to get a replacement. What I would advise is, get insurance from Barclays. They have a tech pack for around £9.50 a month. That will cover loss and accidental damage. Better than the Care Refresh imho. From when I researched it, I think you get to have two replacements a …From when I researched it, I think you get to have two replacements a year. You pay the initial £99 and then £79 for first replacement and £150 for the second. Each time you have to send the drone back. So if you lose your drone due to a fault you won't be able to get a replacement.What I would advise is, get insurance from Barclays. They have a tech pack for around £9.50 a month. That will cover loss and accidental damage. Better than the Care Refresh imho. Yes you are correct, you ship it to the Netherlands I think. Thought the tech pack covered loss, may be they stopped recently or it's a different pack altogether. Yes you are correct, you ship it to the Netherlands I think. Thought the …Yes you are correct, you ship it to the Netherlands I think. Thought the tech pack covered loss, may be they stopped recently or it's a different pack altogether. Thanks for your help! I've bitten the bullet and order from TomTop, fingers crossed everything goes well. Hope the quidco tracks too. Over the next couple of days will have to try and find the best price for DJI care refresh. DJI Care Refresh has only one price and you have to buy it within 48hours of activating your drone (which will probably be day one). I suggest you do a bit of research on it and see if insurance or the Care Refresh will work better for you. DJI Care Refresh has only one price and you have to buy it within 48hours …DJI Care Refresh has only one price and you have to buy it within 48hours of activating your drone (which will probably be day one). I suggest you do a bit of research on it and see if insurance or the Care Refresh will work better for you. Care Refresh doesn't cover loss though?? Plus you have to spend £79 for a replacement which in total costs you £178. An insurance policy is probably less that £120 for the year. DJI Care Refresh is only for 1 year and cannot be renewed. Care Refresh doesn't cover loss though? ?Plus you have to spend £79 for a …Care Refresh doesn't cover loss though? ?Plus you have to spend £79 for a replacement which in total costs you £178. An insurance policy is probably less that £120 for the year. DJI Care Refresh is only for 1 year and cannot be renewed. Yes that's what I mean, care refesh covers pretty much everything but loss, and so the only advantage that an Insurance policy would have is if it did cover loss. Right now I can only see insurance policies that cover the same things as the Care refresh. If you happen to know of any insurance policies other than barclays, do let me know, as they seem to be quite non-existent. Thought you were buying the Mavic lol. 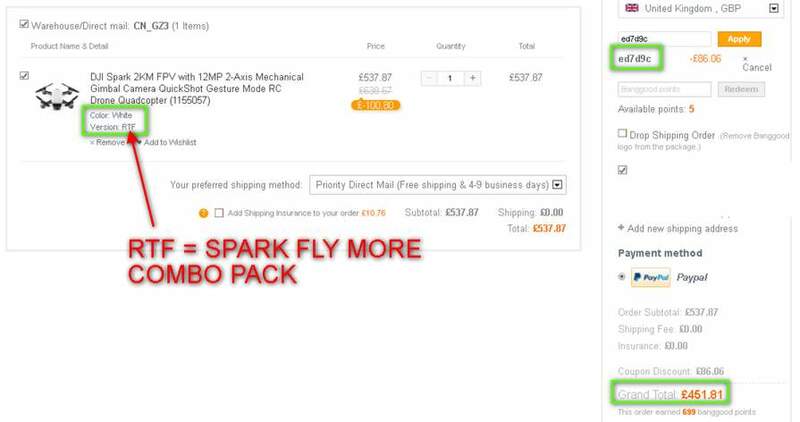 Ah no I considered mavic but went with the spark due fly more combo due to lower cost and size. By the way, did your Mavic from Banggood come with English instruction manuals, or were they all in chinese? By the way, did your Mavic from Banggood come with English instruction …By the way, did your Mavic from Banggood come with English instruction manuals, or were they all in chinese? Don't think it comes with a manual. I didn't bother checking as I already downloaded and printed a manual out. Thinking of ordering from TomTop for the Spark Combo at £445 - how’s it going for you? Ok this website sells products worth thousands of pounds but wont let you pay directly with a credit card? Just argued with the live chat host as I wanted to pay the mavic up over a year and tried to explain that paying through paypal with a credit card wont cover me insurance wise. If you plan to buy anything over £500 it wont let you select a credit card option for anyone whos intrested. Thinking of ordering from TomTop for the Spark Combo at £445 - how’s it go …Thinking of ordering from TomTop for the Spark Combo at £445 - how’s it going for you? Good to have the European warranty. DJI are very sly though, different parts of the drone have different warranty periods (some only 6 months) so if you do find a problem with yours, make sure you start a case with them straight away. Deal posting newbie! This is bitcoin5 first deal post. Help out by leaving a posting tip or just to show your appreciation for their contribution.